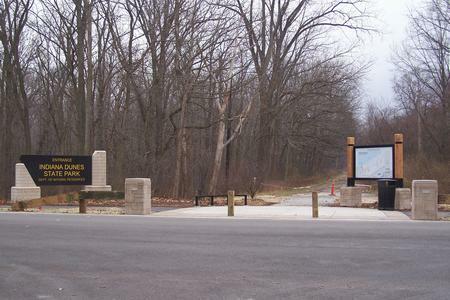 Dune Park Station is located on US 12 just east of SR 49 near the entrance to the Indiana Dunes State Park. SR 49 provides a connection from the park entrance south to US 12, US 20, I 94 in Chesterton, the I 80/90 Toll Road south of Chesterton and further south to Valparaiso and beyond. 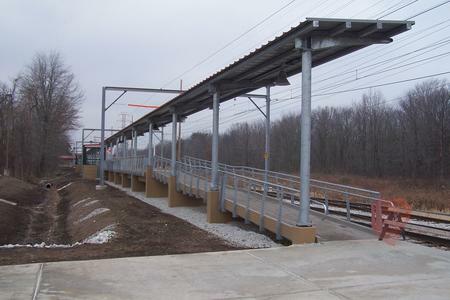 The Dune Park Station was built in 1985 replacing a stop 3/4 miles east at Tremont Rd. 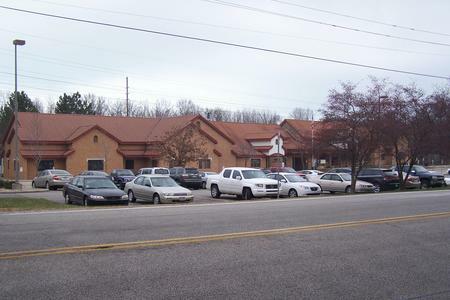 The western portion of the station building serves as headquarters for the Northern Indiana Commuter Transportation District (NICTD). 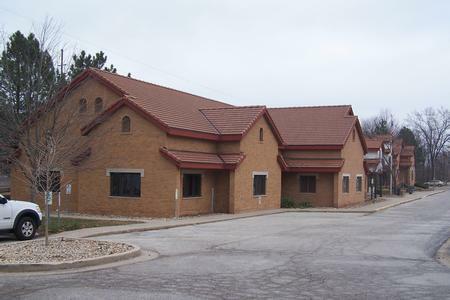 The Dune Park Station provides parking for commuters who arrive via US 12 and SR 49 from neighboring communities as well as State Park access via the Dunes-Kankakee Trail. 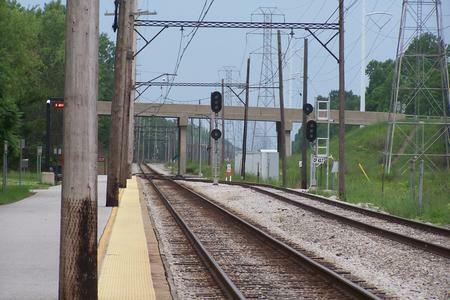 The Calumet Trail paralleling the South Shore Line also connects to the station. 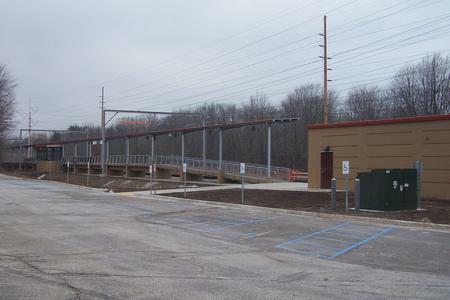 Dune Park Station as seen from the Dunes-Kankakee Trail on the SR 49 overpass bridge. 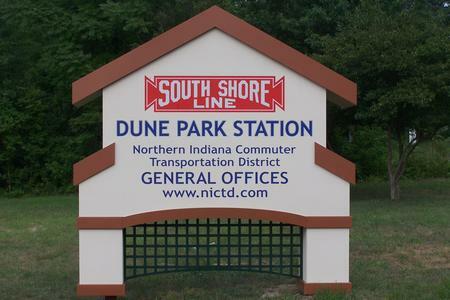 A new sign for the Dune Park Station was installed along US 12 in 2010. Dune Park Station as seen from US 12. The western portion of the building serves as the NICTD General Offices. 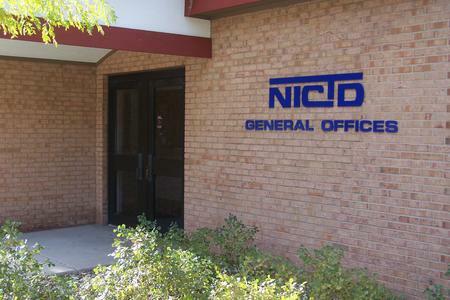 The entrance to the NICTD General Offices. The eastern portion of the building serves as the main station building. 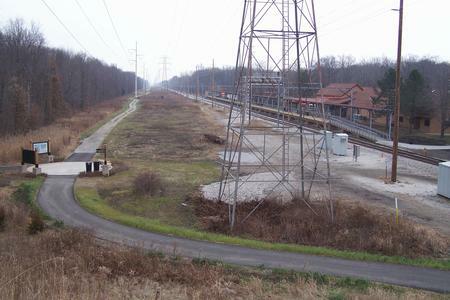 Looking west toward the end of the platform and CP 43.7. Overhead number signs show the stopping points for westbound trains. Looking east along the platform at the back of the westbound signals for CP 43.7. The walkway to the main station can be seen at the right. Signs along the station platform identify the station. A second sign shows the direction to nearby attractions. Looking west along the platform at CP 43.7 westbound. Looking east along the platform. 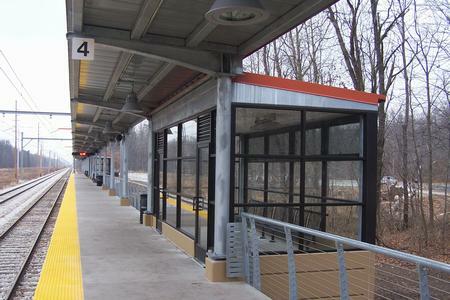 The platform has two enclosed warming shelters with benches and heaters. The number signs near the track give a reference point for the trains to stop (favoring the west end of the platform near the station building). 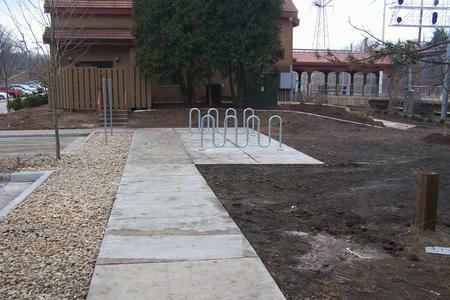 Each shelter has a bench for seven people, wheelchair space and additional space for standing. 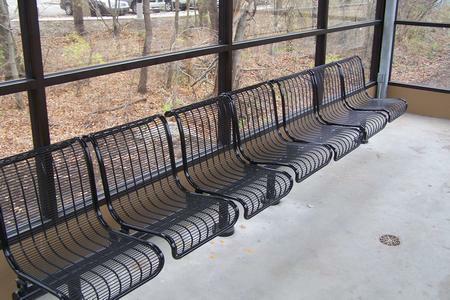 Benches are also available in several locations along the platform. 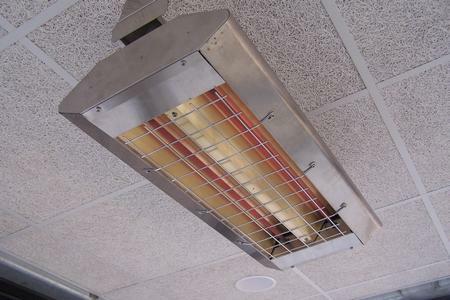 Each shelter is also equipped with two overhead heaters (one shown). Passengers can press a button to "call for heat". The heaters automatically shut off. 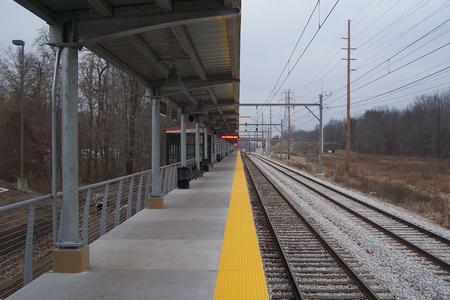 Looking west from the east end of the platform. 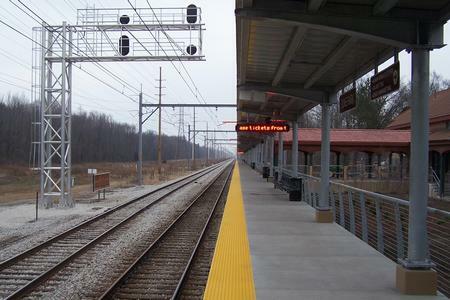 Looking east from the east end of the platform. Handicap parking is available in parking lots at both ends of the platforms. The slots shown are in the east parking lot at the east end of the platform. Ramps are available at both ends of the platform. Additional handicap access is available through the station building. 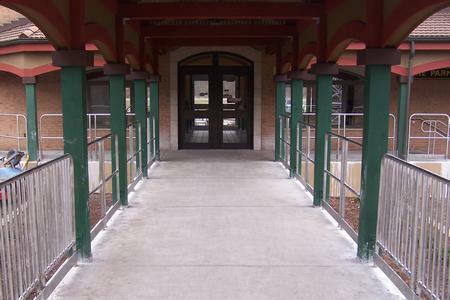 A walkway extends the main building out to the platform. 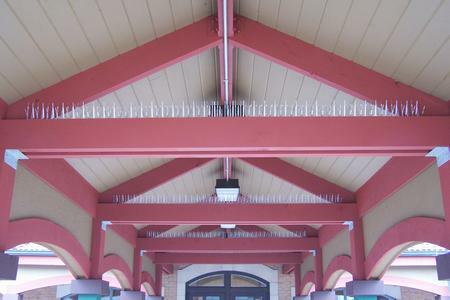 To help prevent birds from nesting above the walkway to the main station spikes have been installed. 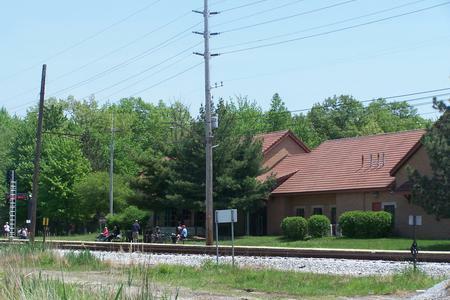 Two views of the Dune Park station building as seen from the Calumet Trail. 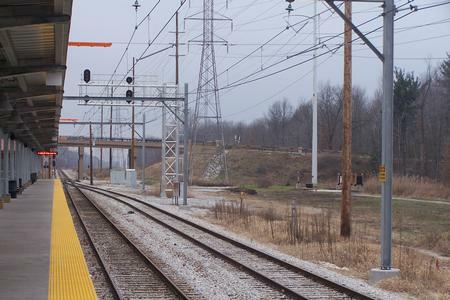 A westbound train makes a stop at the station on its way to Chicago. Inside the station building - Looking northwest. A diarama is on the west wall of the building with the platform to the north. Inside the station building - Looking southeast. Restrooms and ticket machines are on the east end of the building with parking to the south. See construction photos on the 2013 Dune Park Construction page. West of Dune Park Station there is a connection to two trails: The Calumet Trail that runs along the South Shore for 9.1 miles and the Dunes-Kankakee Trail under construction between the Indiana Dunes State Park (one mile north) and the Kankakee River on the southern edge of Porter County. Trailheads are at junction points and signs have been posted clearly marking the trail along with popular destinations. A "State Park" sign has been added to the sign above. 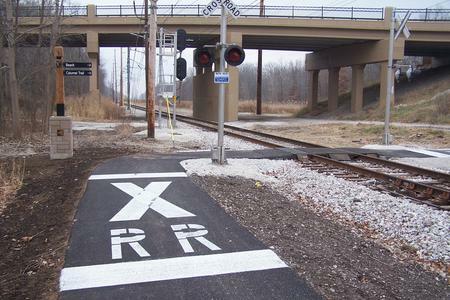 The railroad crossing west of the station platform is protected with lights and a bell. The Calumet Trail looking east from the Dunes-Kankakee Trail (SR 49 bridge). The Dunes-Kankakee Trail looking north along SR 49 from the bridge. 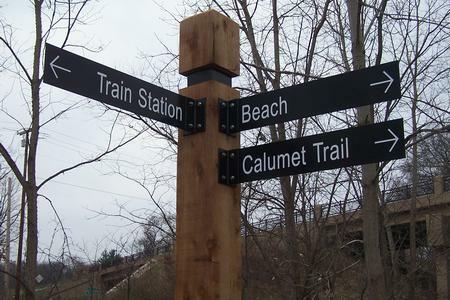 A directional sign points the way from the Dunes-Kankakee Trail along SR 49 down a connecting path to the Calumet Trail and train station. 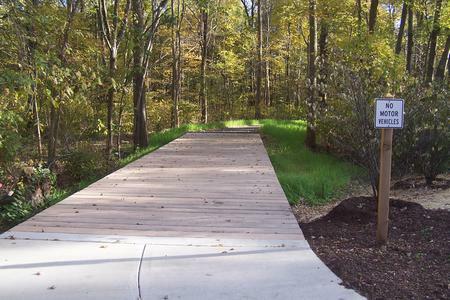 The connecting trail to the station from SR 49 begins with a concrete boardwalk that allows water to flow under the path. 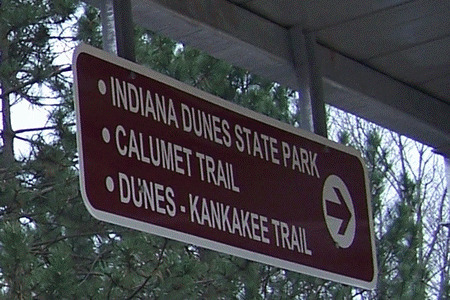 The Dunes-Kanakee Trail continues north to the Indiana Dunes State Park. This section of SR 49 was a four lane road with people walking between the station and the beach along the side of the road. 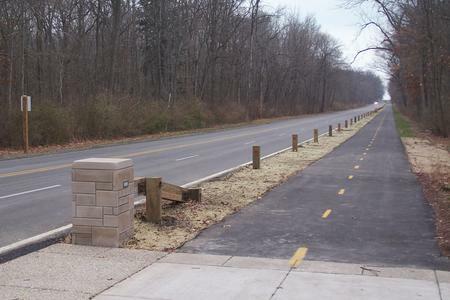 The trailhead just south of the Indiana Dunes State Park. The entrance gate is down the road to the left. 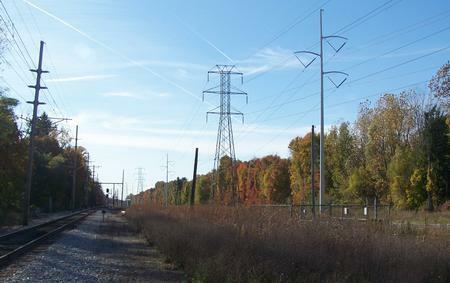 The former road to the east is a trail along the south edge of the state park leading to Tremont Road and the Calumet Trail. 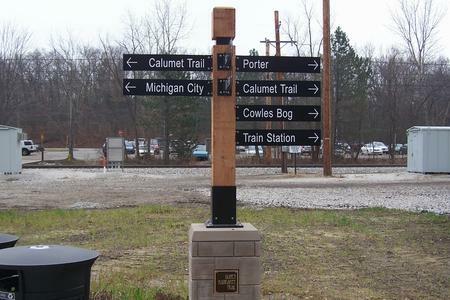 The old sign pointing to Dune Park Station and the Calumet Trail as seen during construction of the Dunes-Kankakee Trail. The path to the station was a simple dirt trail. 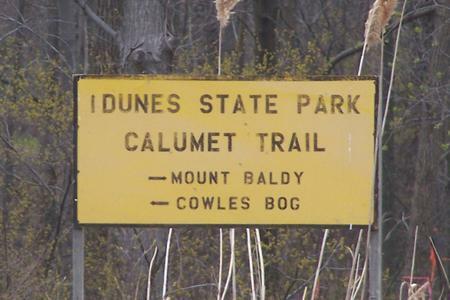 Prior to construction of the Dunes-Kankakee Trail and the trailheads pictured above this was the old sign near the station on the Calumet Trail. The barely noticible arrow heads point the way to the state park and other attractions. 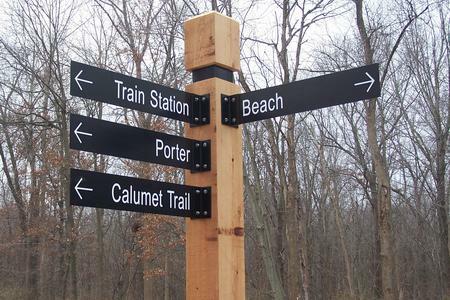 The Calumet Trail is a 9.1 mile county operated trail that runs on the NIPSCO right of way from Mineral Springs Road (about 1.5 mile west of Dune Park Station) eastward to the Porter/LaPorte County Line. 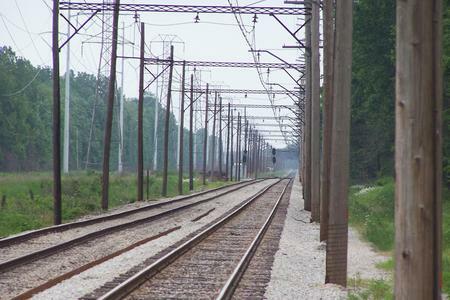 There are long term plans to extend this trail east into Michigan City. The western end connects to trails operated by the National Parks Service. The Dunes Kankakee Trail is a new trail that runs from the Indiana Dunes State Park (about 1 mile north of Dune Park Station) south toward Chesterton and Valparaiso. When complete the trail will run all the way to the Kankakee River on the south edge of Porter County. 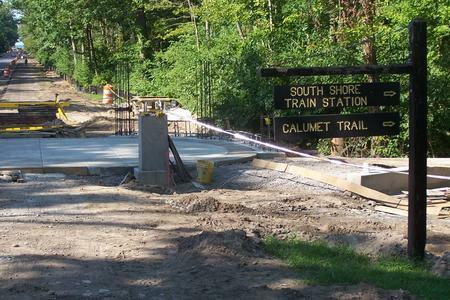 The main trail runs along the east side of SR 49 on the bridge over the South Shore and US 12 with a spur through the woods just north of the South Shore station to connect to the Calumet Trail and the station. 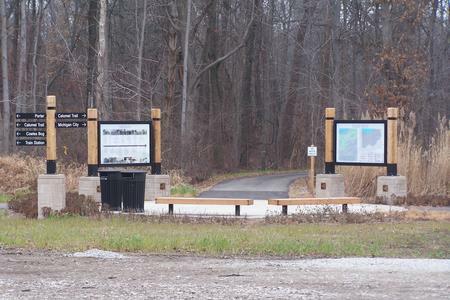 The first segment of the Dunes Kankakee Trail opened at the end of 2013. 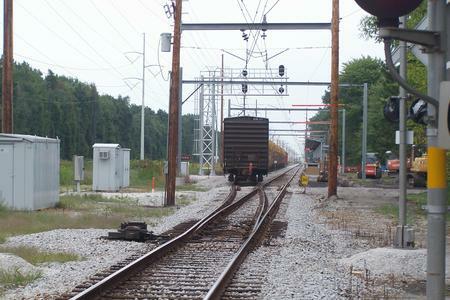 To keep freight cars away from the platform edge freight trains are routed to the siding between CP 43.7 and CP 43.0. 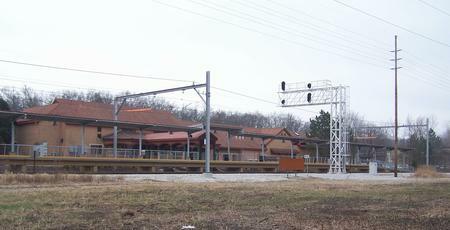 This route may also be used for passenger trains that are not stopping at Dune Park (generally out of service trains). CP 43.7 set for a freight train to pass. CP 43.7 set for a passenger train to pass. (Note: The top two photos were taken from the public pedestrian crossing west of the station platform. The USGS map to the left shows the Tremont area in 1953. The three mountains (Mt Tom, Mt Holden, Mt Jackson) from which Tremont got its name are located along the lakefront in the Indiana Dunes State Park. In 1837 a village called "City West" was located near what became the main beach area of the state park. The village failed in 1837 and "New City West" took root along the Dunes Highway to the southeast. 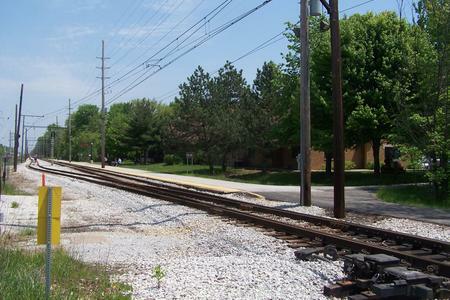 In the early 1900s the Chicago, Lake Shore & South Bend Railway platted what became the CSS&SB railroad through the area and in 1908 "Tremont" was born. The Indiana Dunes State Park opened in 1926. Combined with the beginning of the Samuel Insull Era for the railroad Tremont became a tourist destination for passengers from the cities of Chicago and South Bend visiting the dunes. The CSS&SB station building was located on the north side of the railroad in Tremont, just east of Tremont Rd (shown with a red square on the map). 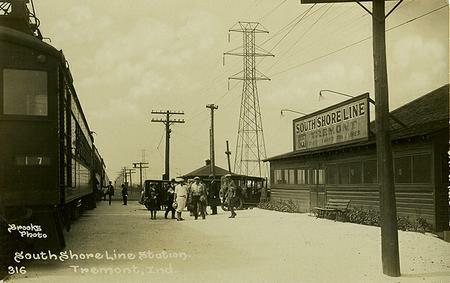 In 1927 the South Shore offered a special $2 round trip fare from Chicago to Tremont for an "81 minute scenic ride". Round trip from South Bend was $3.02 with a special $1.75 fare on Saturday and Sunday. The town of Tremont failed in the 1930's due to the depression with the "City West" post office remaining in Tremont until the 1940s. The Indiana Dunes National Lakeshore was authorized in 1966. The homes and businesses in the Tremont area were removed over the next two decades as the National Lakeshore expanded to more than 15,000 acres. Tremont is now a memory with Tremont Rd (N 100 E) ending at US 12 south of the railroad. 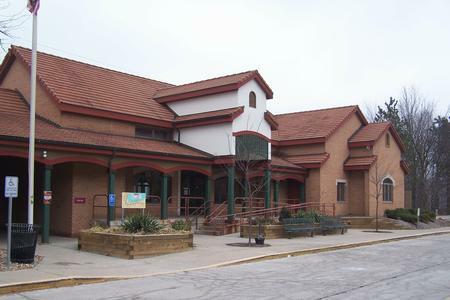 Dune Park station was built about 3/4 miles west of Tremont using the name "Tremont (Dunes State Park)" when the station opened in 1985. 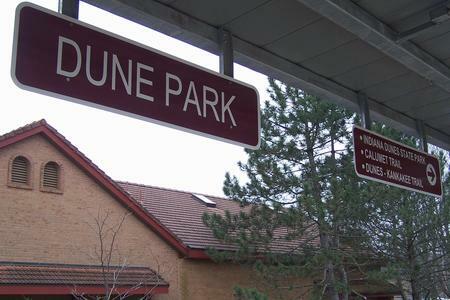 The new station was officially named Dune Park Station in 1986. 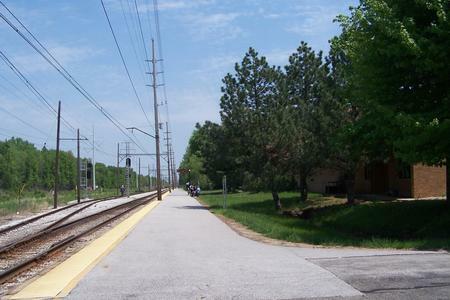 In keeping with history a path was built through the woods north of the station connecting the station to SR 49 where passengers can continue to travel north to the Indiana Dunes State Park. The map to the left shows the situation as it is today ... with Dune Park Station occupying the space between US 12 (Dunes Highway) and the South Shore Line. 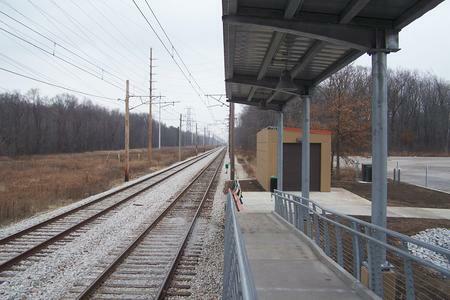 The Indiana Dunes National Lakeshore surrounds the station with the Indiana Dunes State Park to the north. North of US 12 SR 49 is no longer a four lane road. 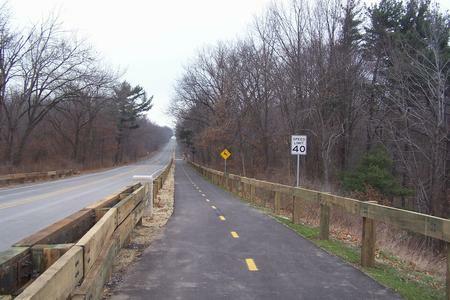 The east lane has been removed and converted into the Dunes-Kanakakee Trail. The remainder of the road has been converted into two lanes northbound to the park and one lane southbound. At US 12 SR 49 narrows to one lane in each direction as it crosses over US 12 and the South Shore Line (the trail is maintained on a barrier separated portion of each bridge). South of US 12 SR 49 is at least two lanes in each direction through Chesterton all the way to Valparaiso. The site of the former Tremont Station. 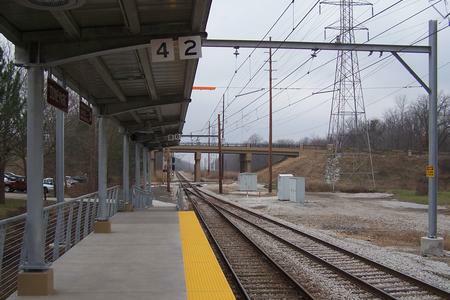 Dune Park Station before construction of a new high level boarding platform began in 2013. 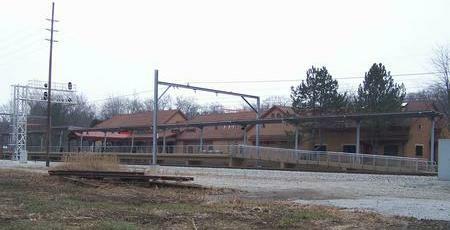 As seen from the Calumet Trail, Dune Park Station is nestled in the woods next to the main entrance to the Indiana Dunes State Park. The building is divided into two sections. The eastern section has a waiting room with restrooms, vending and a transit police station. The western section is the corporate offices for NICTD. A covered walkway separates the two sections. 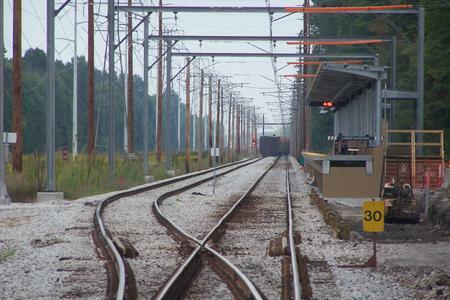 Looking eastbound along the platform at Dune Park. The old low level platform is shown in this picture, extending east to the connection to the eastern parking area. 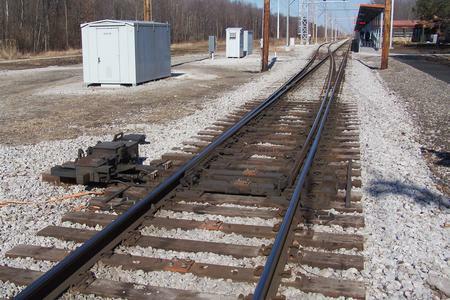 The switch for the siding is just west of the platform end. 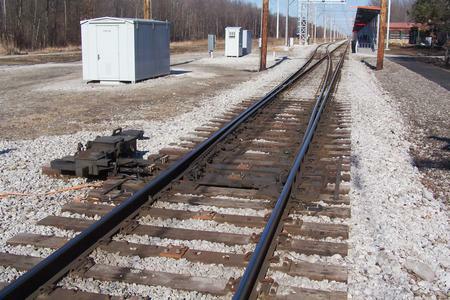 There was a slight "bump" to the north in the siding track to go around the signal between the two tracks (now removed). Arriving eastbound at Dune Park trains pass through CP 43.7. This signal was moved west closer to the SR 49 overpass. The crossing lights in the background are on the access path to the Calumet Trail. Looking westbound along the platform toward the signals at CP 43.7. 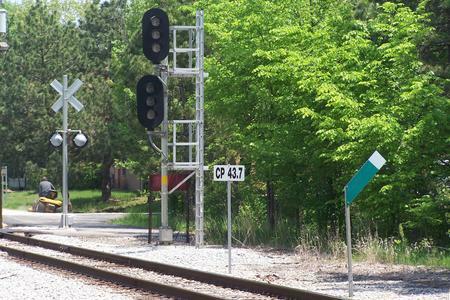 These signals were removed in April 2013 and replaced with a cantilever signal.